German rabbi; born at Mannheim Nov. 14, 1826; died there Sept. 5, 1899. He received his secular education at the University of Heidelberg, and became rabbi at Endingen (1854), at Merchingen (1857), and district rabbi at Bayreuth (1858). 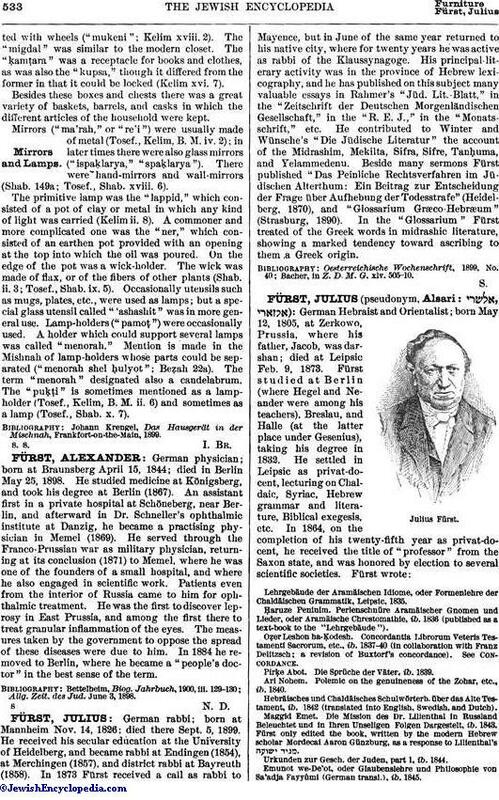 In 1873 Fürst received a call as rabbi to Mayence, but in June of the same year returned to his native city, where for twenty years he was active as rabbi of the Klaussynagoge. His principal literary activity was in the province of Hebrew lexicography, and he has published on this subject many valuable essays in Rahmer's "Jüd. Lit. Blatt," in the "Zeitschrift der Deutschen Morgenländischen Gesellschaft," in the "R. E. J.," in the "Monatsschrift," etc. He contributed to Winter and Wünsche's "Die Jüdische Literatur" the account of the Midrashim, Mekilta, Sifra, Sifre, Tanḥuma, and Yelammedenu. Beside many sermons Fürst published "Das Peinliche Rechtsverfahren im Jüdischen Alterthum: Ein Beitrag zur Entscheidung der Frage über Aufhebung der Todesstrafe" (Heidelberg, 1870), and "Glossarium Græco-Hebræum" (Strasburg, 1890). In the "Glossarium" Fürst treated of the Greek words in midrashic literature, showing a marked tendency toward ascribing to them a Greek origin. Bacher, in Z. D. M. G. xlv. 505-10.